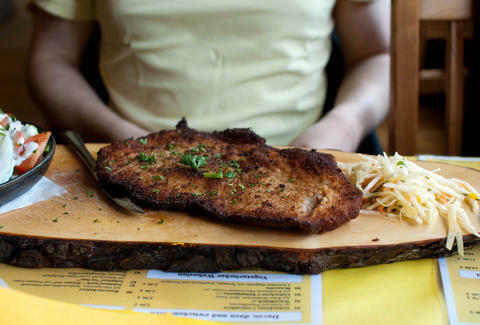 For the ultimate in weird, try the true Berliner schnitzel made from a cow udder. You read that right: this Old World classic is roasted cow’s mammary glands. Not many places serve up the delicacy these days, but this Prenzlauer Berg restaurant plates it with a warm glass of milk cabbage salad in raspberry-mustard marinade. For a slightly less-daring entrée, they’ve also got Schnitzel à la Holstein –- named for an old German diplomat -– topped with a fried egg, salmon tartar, and trout caviar. It makes sense that a place whose name translates to “Schnitzel King” would have some royally good cutlets, and Schnitzelkonig delivers. 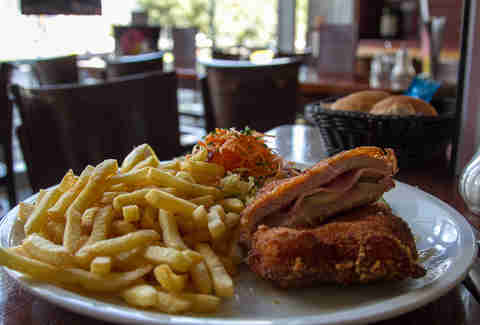 Not only does their fried meat come in XXL size, but this place does some pretty interesting variations on the classic, incl. 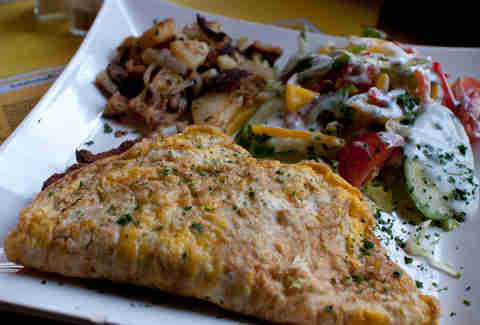 a Hawaiian-style number w/ pineapple & cheese, as well as the schnitzel-stuffed omelet above. 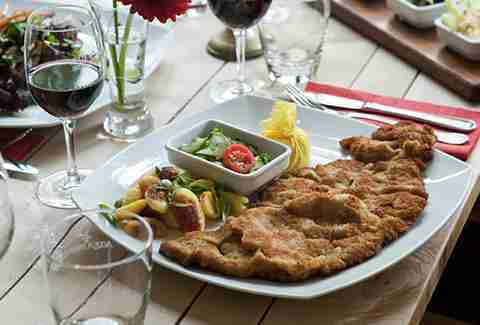 This Mitte beer hall offers an around-the-world taste of schnitzel, incl. the London, topped with creamed 'shrooms; the Budapest, covered in a tomato-ratatouille mix; and the classic Wiener, gloriously topped with a fried egg. This place's name literally translates to "pig out", and these dudes live up to it with a schnitzel calzone stuffed w/ cheese, onions, bacon, and pepperoncini, as well as a pork-packed, chorizo-filled number. There are also 32 locations throughout Germany, in case your porky cravings come calling elsewhere. 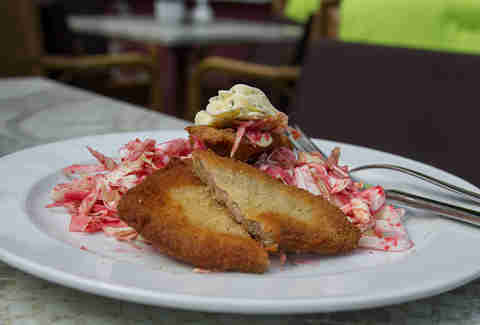 These dudes make East German schnitzel... that's right. 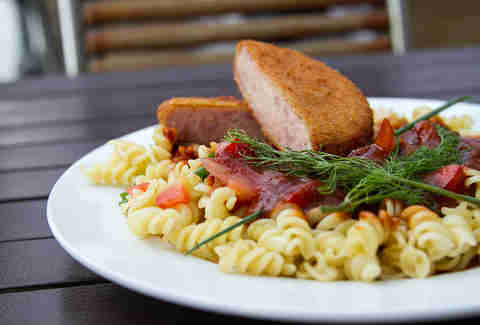 Since meat of pretty much every kind was scarce during Berlin’s walled period, those on the commie side created the German classic Jägerschnitzel, which sadly is not made with gross-tasting herbal liqueur, but Jagdwurst: a spiced pork sausage kind of like bologna, served on top of pasta with tomato sauce. 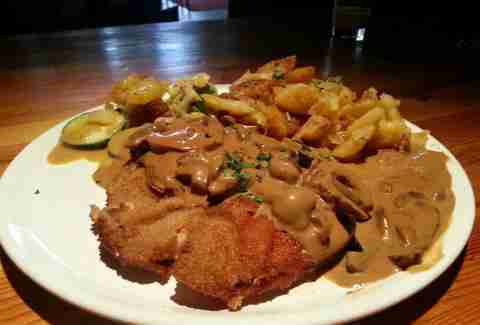 Wednesday is schnitzel day at Matzbach, the restaurant inside Kreuzberg’s Marheineke Markthalle. Try it Gypsy-style w/ hot sauce, or order the Hunter, which comes loaded w/ mushrooms. 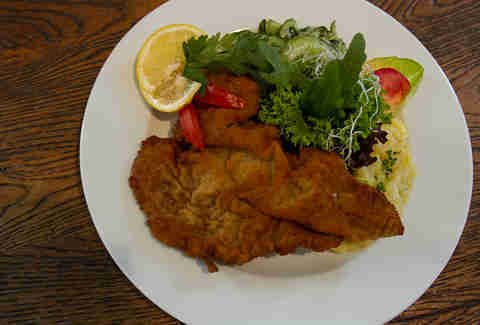 When a place has schnitzel in its name, you can be pretty sure they're not selling sock puppets -- they've got beef, pork, veal, and turkey cutlets, not to mention this Gesottenes cow schnitzel covered in a mustard crust.